It seems that junipers can survive just about anything nature can throw at them, including, intense winds, oven hot to arctic cold temperatures , drought and they even seem to grow from solid rock, making them one of the most successful groups of plants on Earth. It takes a master of survival to thrive in some of the harshest environments in the world. And ‘masterful survivor’ aptly describes the more than 50 species of junipers worldwide because junipers grow in some of the most inhospitable landscapes imaginable. They prosper in relentless winds, blistering heat, bitter cold and parched, drought-stricken landscapes around the world. The secret to juniper success is a massive root system. For our native Utah juniper, the tap root may penetrate 25 feet and spread laterally 100 feet, accounting for 2/3 the biomass of the tree. Such a root system makes junipers terrific competitors. But they don’t stop there. Like sagebrush, junipers may produce chemicals that inhibit the germination of seeds from competing plants. And with their deep root system, junipers don’t really depend on summertime rains so the duff they create under the tree repels water, further inhibiting competition. Add to this the fact that junipers are long-lived (the known record was 2,000 years old) and you have a real survivor. Although they are often called cedars, junipers are members of the Cypress family and are not related to the true cedars found in the Old World. Even the redcedar (spelled as one word), with its fragrant wood that is popular for making “cedar” chests, is a juniper (Eastern juniper), not a cedar. 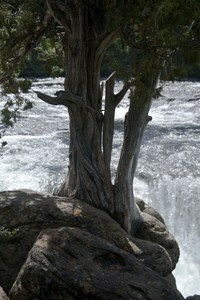 Four species of juniper are found in Idaho: Rocky Mountain juniper, Utah juniper, Western juniper and common juniper. The first three are similar with scale-like overlapping leaves, an often rounded shape and medium height. Common juniper, on the other hand, has awl-like short sharp needles and in the west is often prostrate. As conifers, all junipers bear cones but they are modified to resemble berries, usually blue with a whitish bloom on the outside. Junipers provide a variety of products for humans. Juniper wood is extremely rot resistant, a fact put to good use by early settlers. Fence posts made from juniper could last a generation or more. Juniper berries are the primary flavoring of the alcoholic beverage, gin and are also used to make flavorful meat sauces and essential oils. Where they exist, junipers often dominate the landscape. The Utah juniper is the most prominent plant in Utah, covering one-fifth of the state. Wildlife is likely to key on such an abundant plant and that is the case for juniper. In the west, at least seventy-three different bird species breed in juniper habitat. Birds, rabbits, various rodents and even coyotes eat the berry-cones with relish. Research in Eastern Idaho demonstrated that wintering mule deer prefer juniper for cover whenever it is available. The masterful survival skill of junipers is wonderfully paradoxical. As great as junipers are for habitat, sometimes they can be too much of a good thing. Without the natural control of wildfire, junipers have muscled into other habitats including riparian areas, springs, aspens and sagebrush where they eventually form juniper monocultures and habitat value actually declines. Maintaining a balance is the key to productive habitat.